For those couples who like to post YouTube videos to their wedding websites, here’s something just released that may be of interest to you. YouTube has launched a cloud-based video-editing tool to enable people to edit their videos online before publishing them on the video-sharing website. The YouTube Video Editor will allow you to combine more than one video together, and can also be used to trim sections of the video to shorten it. You can even add a sountrack! The easy one-click publishing feature lets you publish your edited video to YouTube immediately. 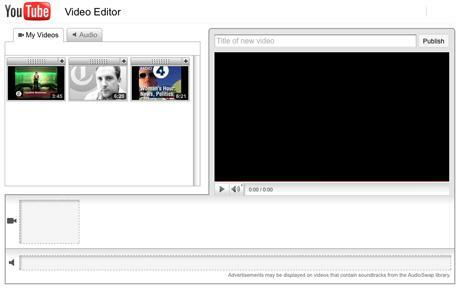 “The editor is ideal for merging single, short clips in to a longer video,” said Rushabh Doshi, a Google software engineer, and Joshua Siegel, a Google product manager, in a YouTube blog post. “For example, you can transform clips from your vacation in to a video travel diary set to music, or create a highlights reel from footage of your last basketball game. Looks like a promising tool for working with online videos. If you have a lot of uploaded clips you’re managing, check it out to see if the new editor will help out.